Mate Ultra QCT tooling—simple and intuitive to set up and fully compatible with Mate’s Ultra family of guides and standard canisters—will star at the company’s display at FABTECH. To set up the tooling, an operator flips the latch to remove a tool and snaps a new insert into place. The punch is keyed at the perimeter of the tool, not the center, providing optimum angularity control. The shoulder of the punch remains securely guided when punching. Another nice feature—only one punch driver is needed for rounds or shapes. Also on display: Mate’s new Salvagnini P0 fully guided perforating tool, designed to accommodate any shape to 0.492-in. dia. 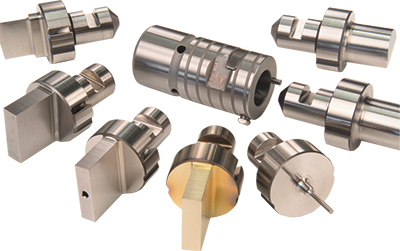 Tight stripper clearance prevents lateral punch movement for accurate hole punching.